Walking in Shanghai is a nice experience. I started to walk to everywhere whenever time allows – following Vince’s leads and best practices of loosing weight by walking. I have gave up exercise for too long, since I broke my ankle. Hope to have some time to make up the time lost. In Shanghai, and with my current walking pattern, I can use Google Maps on my mobile phone to search the driving path from point A to point B, and get the distance. Multiple the distance in km by 10 is the actual number of minutes for me to get there. 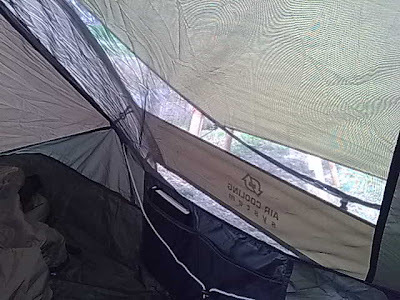 I am a very happy customer of my new Quechua 2 Seconds Air III (Quechua is the brand name, 2 Seconds implies that by throwing the tent into the sky and the tent will be installed in 2 seconds. Air means they have window on the side, and it is called Air Cooling System, and III means three adults can sleep in it). So far, all the promises in the name turned out to be true. I was so excited that I told Wendy that I want to go out and setup the tent at 7:00 AM. But actually, I held my impulse, and behaved mature enough to go out only after 9:30 AM. This is my tent, on the top of a slop, facing to a lake. I made a stupid mistake to tune to the size of the photo from my Nokia phone to be MMS, which is the smallest format, so the photos are very small and blurry. Here is the view outside the camp. Below are the pictures of the side window – the air cooling system, which worked very well. It is cool inside, and people want to get back to tent when the Sun gets hot. 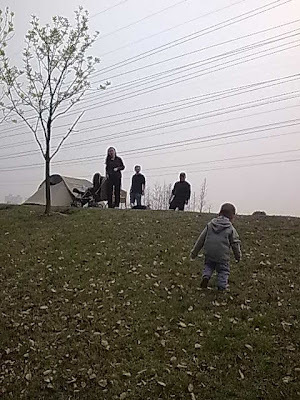 Yifan loves the tent as much as I did, and he enjoys running up and down the slop for many times. Yes. It is him running – he just had haircut in the morning. 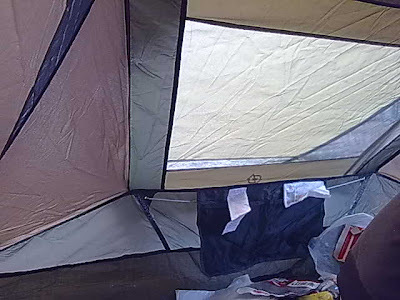 In the tent, I pulled out my mobile phone and start to send SMS and call my friends. Within one hour, Run, Linda, and their lovely 6 months old Xiaomi came. Then Michael came with his mom and lovely 10 year old dog. Then Wang Chen came with Xia,and their 2 year old Xiaopao. Of cause we also have Yifan joining us after his unpleasant haircut (He don’t like haircuts as most kids, obviously). We hung out from 9:30 AM to about 5:00 PM, when the Sun is low on the sky. We brought beers and snacks and chat. We joked that it is a beer festival. I will write about the meaning of travel (Why People Travel). Alan de Botton reminded us that before we go out to somewhere far away, pay attention to your surrounding first. This camp place is very near to where we live, and I believe the happiness, and relax time we got was not less at all from a 1000 mile trip. Thanks my friends for coming, and I will definitely hold another one very soon. Went for camp near where we live, just near the water below. 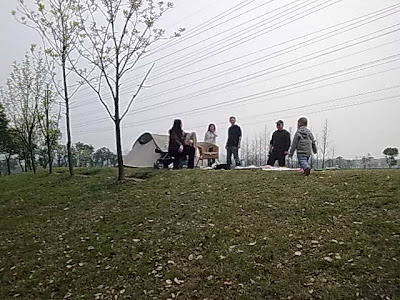 Three families joined the casual camping – three couple + 2 children (Yifan missed the camping because he felt asleep at home). We are close friends from junior middle school. Isn’t it nice to have close friend for, OMG, 20 years? Wang Chen brought his tent for us. 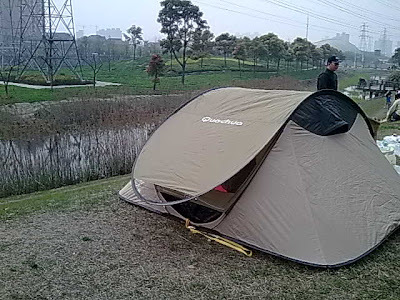 At night, we immediately went to Decathlon in Pudong to get a Quechua 2 Seconds Air III. The first thing I will do tomorrow morning is to setup the camp, give Wendy a morning call, and send Wang Chen a SMS. Autumn arrives in Shanghai. When Wendy and I passed the garden before my apartment in Pudong, yellow leafs were falling to grassland with wind. There is an old Chinese saying: You see autumn just from a leaf . It is very true. 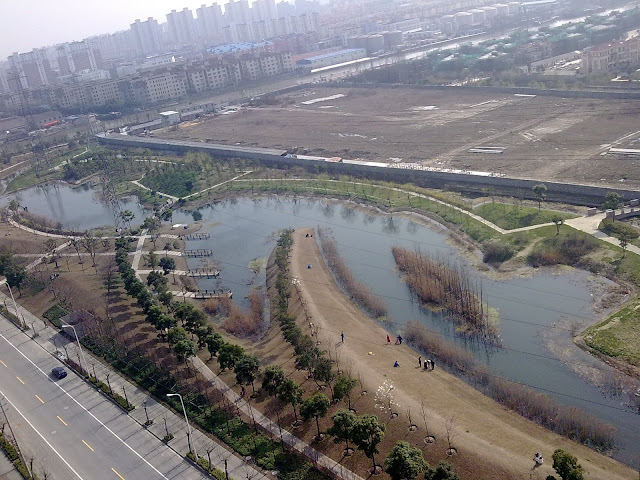 It is the nice weather for us to go to Biyun International District. I love that area very much, especially on sunny weekend. That is an international district, and there are many good restaurants, coffee shop, and nice greenlands. I bought a copy of Lonelyplanet Travel Writing from the foreign language store there. At the football field, many teams are playing an interesting game. It is something between football and volleyball. The playground is a football ground, the ball is a football, but the players just use hands to take the ball and run, and sometimes use foot to kick the ball to pass it to other player. The other player get the ball with hands, run with it, and use foot sometimes. The wear just like football players. Image credit: Shanghaistreets. Note: I didn’t take this photo. Also, it is the photo of 2005, not this year. On the other field, I saw the logo: 2006 Asia Gaelic Games. I have no idea about what Gaelic, until I did some research back home. Gaelic football (Irish: peil ghaelach), commonly referred to as “football”, “Gaelic” or “gah”, is a form of football played mainly in Ireland. Teams of 15 players kick or punch a round ball toward goals at either end of a grass pitch. Gaelic football is one of four Gaelic sports run by the Gaelic Athletic Association also called the ‘GAA’. While not widely known, those who do know it recognise this sport as a strong, skillful, fast paced game. As one commentator put it, “It’s like ballet, but more poetic”. On site, I saw country flag of Korea. 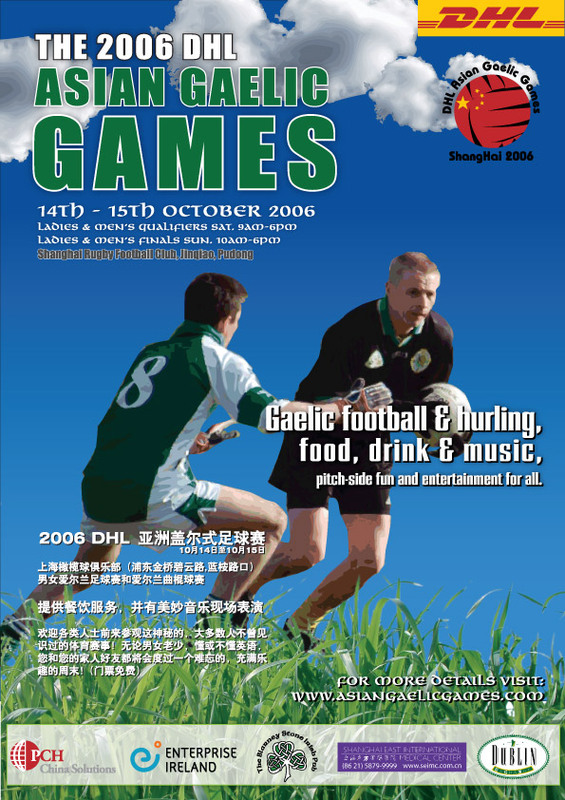 How interesting that a not-so-widely-known game like Gaelic has an Asia competition in Shanghai. Weired. Many local people stood near the game field and watched this “strange” game. More Gaelic Football photos in Shanghai by Shanghaistreets. What to see this “rare” game? It is still there tomorrow. 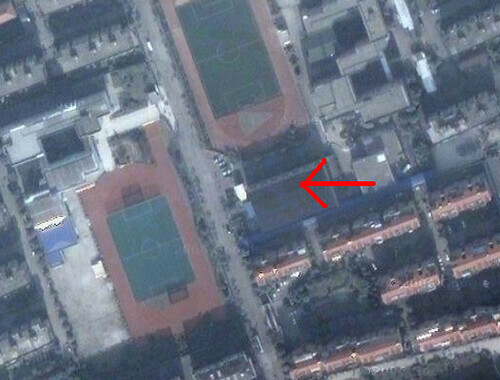 Location: Dulwich International School (just near the Carrefour in Jinqiao. I am just back from badminton with Wendy at the Youyou Badminton. I haven’t had sports for quite some time. So did Wendy. It made us feel very happy. The good thing is, the venue is within walking distance from the place I stay. Here is the Google Map of the Area. There are also middle school, and primary school – good city planning, I have to say. The place has 7 fields for badminton. Very nice place – except it is hot – there is no A/C inside. The price is 30 RMB (a little bit less than 4 USD) per hour. I went to Shanghai International Tennis Center on Hengshan Road for my tennis class today. I started to learn tennis and found it a very decent sports: Nice place, nice dress and nice people. The Shanghai International Tennis Center is among the best tennis facilities in Shanghai. The indoor courts were wonderful. It was built many years before (when I was in university) but still remains very new. I bought my whole set of tennis equipment weeks ago – the shoes, the socks, the pants, the shirt and the rack. I look very professional after I dress everything up, although I still cannot handle the balls yet. Two indoor courts: 150 RMB per hour if it is reserved by the mentor or 300 RMB per hour for hotel guests. Outdoor courts: 60 RMB per hour. At spring and autumn, it is wonderful to play tennis in the outdoor courts – it is in the Xujiahui area, with many trees, flowers and nice villa nearby, which make it one of the most expensive area to live in Shanghai. Reservation in advance is required since many people go there. Greg Black asked “Does anybody else find that beeping noise alerting of closing subway train doors to be almost painful in pitch and volume?”. The beeping is loud and the pitch is not comfortable. But I believe the Metro station have to keep it. Does anyone has any impression of the previous version of the beeping? I guess that version comes from the original German made train. It was soft and not as loud as the current one. It didn’t work well because people seldom pay attention to it. They entered the train when the beeping started only to find the door close with one leg or one arm outside the train. The doors have to re-open to release the passenger. It happened very often. Then came the current door-closing beep. It was sunny today, nice weather to have a cup of coffee and spend the whole afternoon in the Sun shine. Wendy did it today and was very happy. 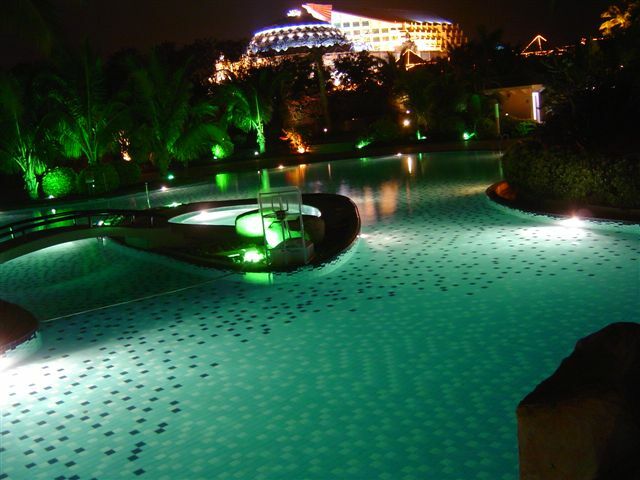 Easy access to free (so called free) swimming pool is a big advantage to stay in a hotel. I have stayed in hotel for about one month. The biggest progress in the last month is that I can swim now. Why the nice swimming has to be built near the wonderful beach? I spent most of time in the sea and missed this nice swimming pool. Today is another breakthrough. 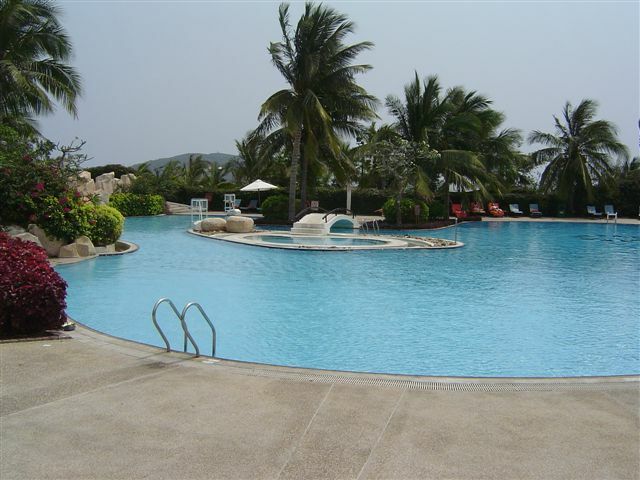 I found myself suddenly get used to the water and be able to swim along the longer edge of the swimming pool – about 25 meters back and forth. I guess I have continuously swam about 10 round, with is about 500 meters already. I couldn’t believe it because I can hardly complete the 25 meter track along the last time. It is called magic. I love swim now and I can put swimming to my favorite sports list now. This is the keep takeaway I got in August 2004. Just after I returned to hotel around 9:15 pm from the hospital of my college, the telephone in my room started to ring. I rushed to pick it up and it was Mr. Shen from China Radio International. We made appointment about the interview, on this blog. I guess the program will be online (should be on air) very soon. I’d like to thank him and Hailey, and Le who made it happen. I am very relaxed to talk with these nice people. Hailey and Allen already put online a report at the headline of Real Estate Channel days before, titled Guanxi and Big Money Get the Homes in a Seller’s Market. 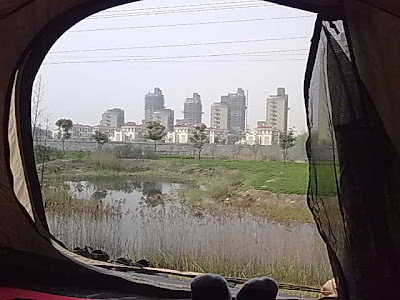 It was about my story to buy a house in Shanghai, with my big silly picture there. I have to point out that the hot real estate market may have ended. The N-N-N policy (“No Price. No Reception. No Apartment”) was true in October 2003, but not now. Anyway, I’d like to thank them to make it online. It is said another article about my blog will go online (the web version) in another channel. I am not sure though. P.S. China Radio International was founded in 1941. CRI broadcasts 290 hours everyday in 43 languages. It is the most powerful radio station for overseas audience in China. One major deficiency is Mr. Wong so reluctant to reply to the enquiries you received some how made people think you are so elegant. This reminded me that I didn’t reply comments as frequently as I did before. This is due to the pressure of my current project. I noticed I should try harder to keep participating in the wonderful discussion. Just let you know that I did read all comments but didn’t have time to reply – not because of elegant. :-D. Thanks Stephen for pointing it out. Skiing in Shanghai? Are you joking? But it is true. 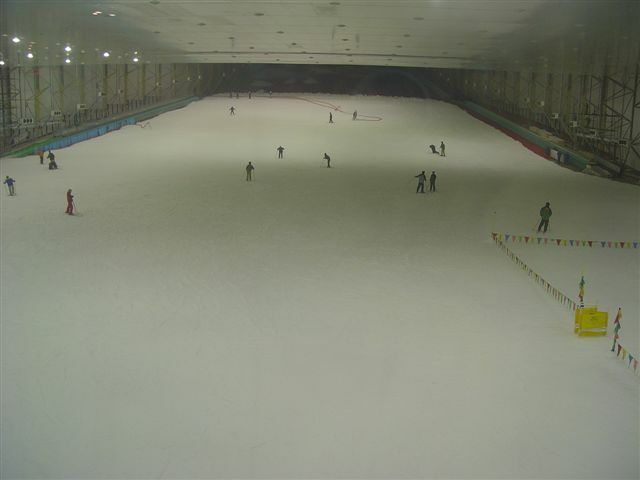 I am very excited to share my experience with one Indoor Skiing Site that just opened in Shanghai. I am learning to ski. This is the first photo in my life in Skiing Shoes. The overview of the skiing site. This is how the snow was made. 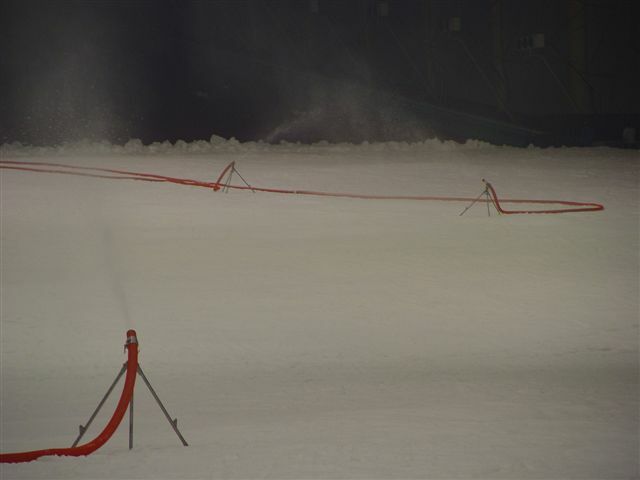 Three large pipe is blowing snow pieces to cover the surface of the ground. 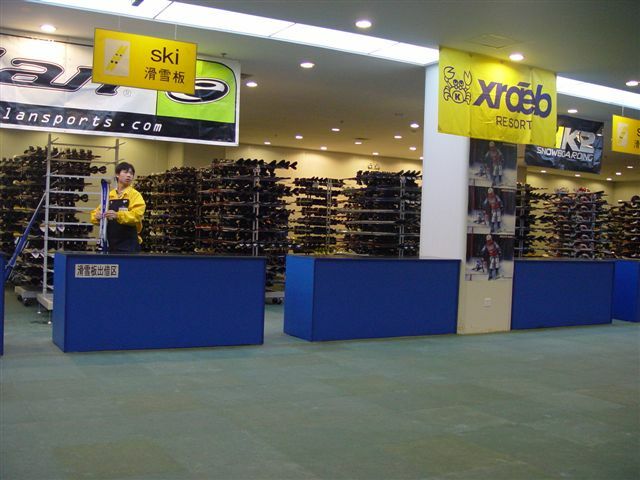 The counter to get skiing shoes. 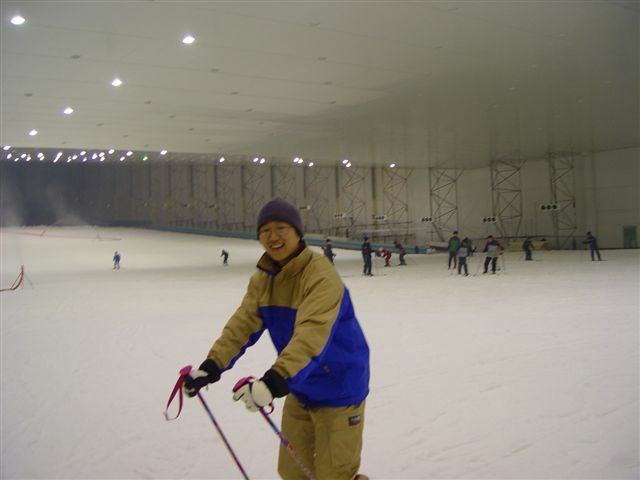 Current price (as of January 12, 2004): 125 RMB for unlimited skiing time. It is closed at 1:00 AM. Sounds good.